A cached page is a snapshot or a version of a web page saved at a specific time and stored by a web server as a backup copy. Checking a cached version of a page is useful if the original page has been removed by the site owner. Once in awhile someone will overwrite their page content in error, losing the content that they did not intend to delete. 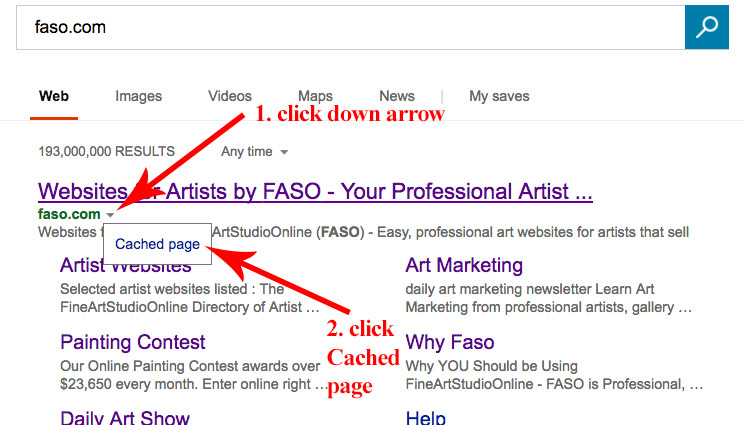 The only way to recall the content of the page is to track down a cached page of the site. Following are some resources for accessing cached pages. Web.Archive.org is more comprehensive than google or bing caches. We highly recommend saving text in a backup document, preferably as Plain Text (to avoid html code causing formatting issues). How do I assign artwork to my collections?